Emacs is a lightweight Integrated Development Environment. 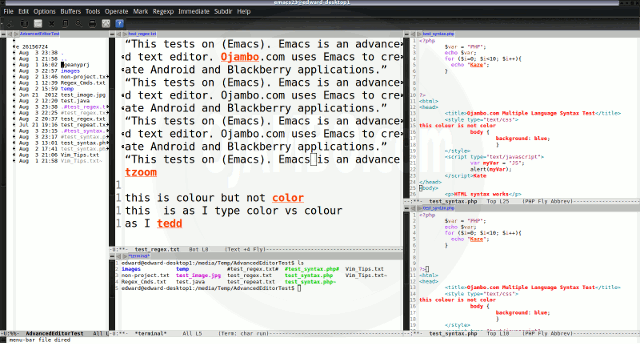 Emacs is free, open source and cross-platform (Mac, Windows and Linux). Emacs is a free text editor from http://www.gnu.org/software/emacs. There are downloadable packages for Linux, Mac and Windows systems. Emacs can easily be extended by plug-ins to ease application development in different programming languages. Regex file: text with word “Emacs” repeated. Emacs was installed from the Debian repository. Emacs and its plug-ins do require GTK2 runtime dependencies. Emacs needs re-installation every time I change my distribution unless built from source. Emacs was installed in the system folder and was never available for other installed Linux distributions. All plug-ins also require re-installation. The theme can be native for the editor in terms of the background. Emacs dark and light themes can be created or downloaded. The score for the theme was a perfect 1.0. Dragging and dropping a text file into the editor opens a new tab or buffer. It is possible to specify the tab location during the drag and drop operation using the tabbar-mode plugin. The score for drag and drop into editor was a perfect 1.0. Opening a very large text file did not crash Emacs. Emacs was able to edit the large file. The score for opening a large file was a perfect 1.0. Multiple documents can opened in multiple tabs or buffers. Tear-off tabs can be mimicked by having Emacs open the current buffer in a new window as a new instance which is handy for multiple monitors. The score for multiple documents was a perfect 1.0. Multiple editors can be opened as new tabs with drag options. Each tab window view can be split either vertically or horizontally as a multiple editor view. The score for multiple editor view was a perfect 1.0. Soft word wrap can be enabled on all documents as line wrapping. Automatic soft wrap for documents is available from the Emacs settings. The score for word wrap was a perfect 1.0. Spell check works as words are typed. Spelling errors are not shown in opened documents automatically, but spell check can work if an entire document is selected. The score for spell check was a perfect 1.0. Word count is available for Emacs. Selection word count is available as part of word count plugin or using a shell pipe. The score for word count was a perfect 1.0. Find and replace using regular expressions can not be utilized for all open documents in the current session. Find and replace will work for the current document or a selection in the current document. The score for find and replacing using regular expressions was 0.5. Code folding does not work for markup languages such as HTML. Code folding also does not work for programming languages such as PHP and Java. The score for code folding was 0.0. Multiple selection is available for Emacs using the multiple cursors plugin by Magnar Sveen. Search multiple selection is not available. The score for multiple selection was 0.5. The file manager is available in Emacs. Media files can be dragged and dropped into the file manager pane. The score for file manager was 1.0. Terminal does not require a plugin. The terminal can follow folder. Terminal can execute system commands. The score for terminal was a perfect 1.0. Emacs is a very powerful text editor. By default, the Emacs editor is missing required features which can be installed by using extensions. For my required features, the Emacs editor scored 90.0% or 9.00 out of 10. Emacs is a very powerful text editor. Basic editor features are missing in Emacs. Important editor features require Emacs plug-ins. Overall Emacs only scored 9.00 out of 10 for essential text editor features. Emacs is able to use the system native theme and fonts. Emacs has one of the multiple select features available for any editor. The file manager can incorporate native GUI features in Emacs. Look for required plug-ins before deciding to try Emacs. 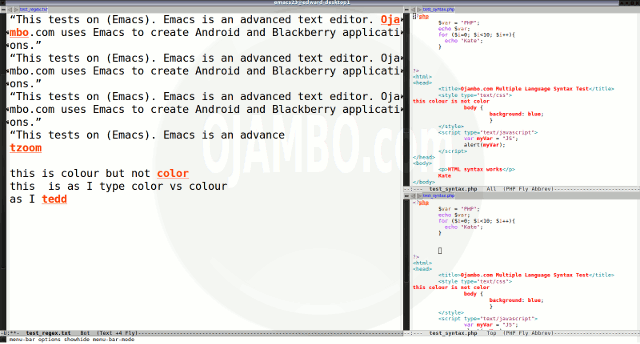 Download desired Emacs editor themes. Install Emacs from your distribution repository if applicable. This entry was posted on Tuesday, November 26th, 2013 at 12:00 am	and is filed under Reviews. You can follow any responses to this entry through the RSS 2.0 feed. You can leave a response, or trackback from your own site.